“The Pacific POW’s who went home in 1945 were torn-down men. They had an intimate understanding of man’s vast capacity to experience suffering, as well as his equally vast capacity, and hungry willingness, to inflict it. They carries unspeakable memories of torture and humiliation, and an acute sense of vulnerability that attended the knowledge of how readily they could be disarmed and dehumanized. Many felt lonely and isolated, having endured abuses that ordinary people couldn’t understand. Their dignity had been obliterated, replace with a pervasive sense of shame and worthlessness. And they had the caustic knowledge that no one had come between them and tragedy. Coming home was an experience of profound, perilous aloneness.” – Unbroken by Laura Hillenbrand. History has been one of my favourite topics and stories about courage, survival, triumph and sufferings are some of the elements that fascinated me. Not because they are depressing, but there are so much we can learn from them. 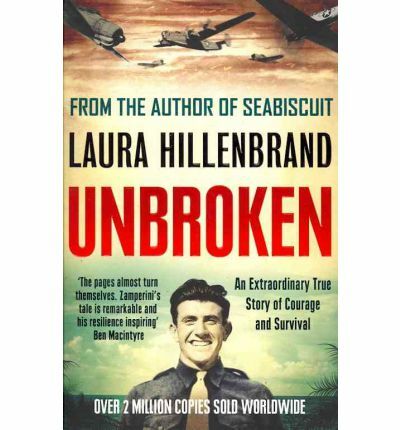 ‘Unbroken’ by Laura Hillenbrand is the first book I’ve read about a war veteran. It is also one of the most remarkable and inspiring books I’ve ever read that I couldn’t stop thinking about it even I’ve finished the 500 pages book. ‘Unbroken’ tells the journey into extremity of an American-Italian named Louie Zamperini. As a boy, he turned to petty crimes, until he found a remarkable talent for running, he joined the Berlin Olympics as a runner in 1936 – the youngest distance runner to ever make the team. Zamperini finished the 5,000 metre event with a stunning final sprint at 56 seconds and was witnessed by Hitler. He called Zamperini ‘the boy with the fast finish’. He became a bombardier during WWII. In May 1943, he was ordered to undertake the search and rescue mission on B-24 aka Green Hornet. The plane crashed into the Pacific Ocean. Battled through failing raft, leaping sharks, thirst, starvation and enemy, Louie survived after 47 days at sea. He was rescued by the Japanese and was sent to the POW camp in the Pacific, where he would live through unspeakable savage cruelty at the hands of the Japanese captors. One in particular, a notorious brutal Mutsuhiro Watanabe aka ‘the bird’ who beat him up almost on a daily basis. He survived the war, but Zamperini could not outrun his past. Every night after the war, ‘the bird’ haunted him in his dream and he would woke up screaming and sweating. His hatred turned into anger. All he thought was to kill ‘the bird’, not knowing that he was killing himself through alcohol. However, he soon found forgiveness, and salvation after listening to a preacher named Billy Graham. He then dedicated his life to God, spreading the Gospel and inspired many people through his story. Zamperini’s dignity and spirit was shattered by years of torture and living in terrible conditions. It is hard to imagine ever getting over such situation. Louis showed an amazing strength and dignity no matter how the Japanese tried to break him. Just like Mail On Sunday stated ‘A massive bestseller…so colourful it reads like fiction’. The fact that Zamperini’s story is so remarkable and inspiring is that he didn’t give up despite everything he had to go through. An uplifting story and I know I enjoy every page I turn. If you haven’t read ‘Unbroken’ by Laura Hillenbrand, go read it. Hi, a story such as this reaches deep inside us all and pulls out a hope that guides us thru! If you go thru a tragedy, you are marked scarred even! But the you on the other end is powerfully refitted with a newfound hope and humanity! I love your review it inspires me! Thank you for the follow! A chain, is just a name, to put on a time of enormous sinister growth! Keep writing! Hi I just tagged you for a new award at bit.ly/NT90PK take a look!